Republican National Committee Chairman Michael Steele made an admission, this week, that was both stunning and obvious. Speaking to a group of DePaul University students, Steele was asked why a black person should vote for a Republican. In responding, Steele put on the record the political equivalent of a Republican reverse-Sasquatch, something everyone knows is real, but pretends is a myth: The Southern Strategy. 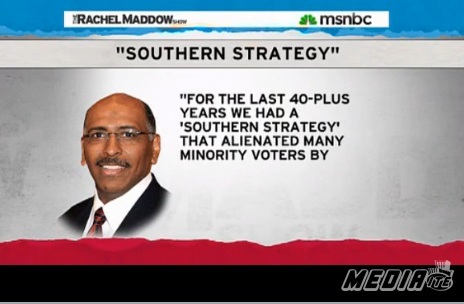 What makes Steele’s comments so extraordinary is the fact that they come from a sitting RNC chair, and they position the Southern Strategy in the present day. As Rachel Maddow and her guest discuss, there have been a scant few other acknowledgments of the strategy, but never from someone who was still in the game. Whatever his motivation, Steele deserves credit for having the courage to speak this truth, and for delivering an opportunity to Republicans that they will very likely squander. Steele’s tenure as RNC chair has been fraught with controversy, but the uproar reached a fever pitch in early April when he acknowledged that black public figures, including President Obama, were given a “slimmer margin of error” than whites. He was accused of “playing the race card,” which Andrew Breitbart will tell you is the worst thing you can do in America, worse than actually being racist. It is that very defensiveness about race that Steele has given his party the chance to shed. I doubt he made these remarks with some grand strategy in mind, but handled properly, they give the Republicans a chance to make their case anew to black voters. When you get beyond the race issue, which has manifested itself politically over the years in the demonization of black people on issues like crime, employment, and welfare, the Republicans can shed some of the policy baggage that has weighed down their efforts to attract black voters. Rather than pretending racial inequities don’t exist (or worse, are stacked against white people), the GOP has a chance to recalibrate its message to include conservative solutions to those inequities. The Republican party can adapt its pitch to appeal to a fairly broad segment of black voters. Many black Americans are deeply religious and socially conservative, a fact that, until now, hasn’t translated into votes. In fact, the exploitation of Reverend Jeremiah Wright during the 2008 campaign likely drove away many of these votes. Much of the conversation surrounding Wright centered on criticism, and misrepresentation, of Black Liberation Theology. The Republican mantra of “personal responsibility” (preached, if not practiced) also has deep resonance within the black community, just not when the finger is pointed from without. Steele’s admission affords an opportunity for the Republicans to position themselves as partners with black leaders, rather than scapegoaters of them. This isn’t just about gaining a large slice of 12% of Americans, either. The GOP’s image as a party unfriendly to black people is a significant obstacle to attracting young voters, as well as voters of any age who are turned off by it. Of course, it’s more likely that Republicans will vilify Steele for this, and continue their long pattern of denial over the issue of race. That’s a shame. because turning this corner would not only be good for the Republicans, it would be good for the country.